Such essentials as a Bloomingdale's white crew-neck sweater and white shorts are an easy way to introduce extra cool into your off-duty arsenal. You can get a bit experimental on the shoe front and spruce up this ensemble by wearing white and black horizontal striped leather pumps. Consider teaming a Bloomingdale's C By Crewneck Cashmere Sweater from Bloomingdale's with a light blue tulle full skirt for relaxed dressing with a chic twist. A pair of beige leather heeled sandals instantly steps up the glam factor of any look. A Bloomingdale's C By Crewneck Cashmere Sweater and blue skinny jeans are a good combo that will effortlessly carry you throughout the day. If you're puzzled as to how to round off, a pair of beige leather ballerina shoes is a smart pick. If you're after a casual and at the same time seriously stylish getup, try teaming a white crew-neck sweater with white ripped skinny jeans. On the shoe front, this look pairs well with blue low top sneakers. 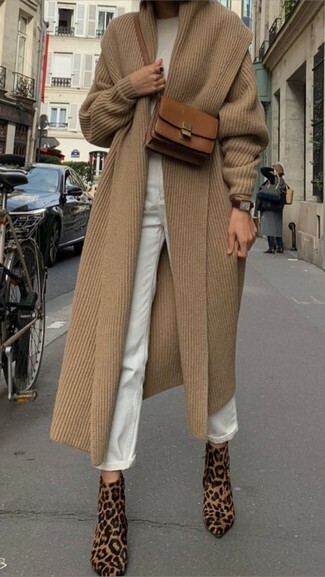 Rock a white crew-neck sweater with a beige pleated maxi skirt if you're after an outfit option that speaks casual chic. For relaxed dressing with a twist, go for a white crew-neck sweater and blue skinny jeans. Switch up this ensemble with a more elegant kind of footwear, such as these grey snake leather ankle boots. 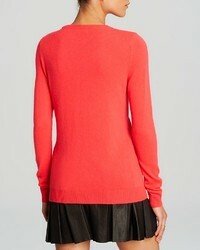 This pairing of a Bloomingdale's white crew-neck sweater and charcoal leggings is a safe and very stylish bet. And if you need to immediately dial down your look with a pair of shoes, why not complete your getup with black athletic shoes? Display your sartorial expertise by opting for this casual pairing of a Bloomingdale's white crew-neck sweater and navy skinny pants. You can get a little creative in the footwear department and complement this outfit with a pair of white high top sneakers. Extremely stylish and practical, this combo of a white crew-neck sweater and white boyfriend jeans will provide you with amazing styling opportunities. Finishing off with tan leopard calf hair ankle boots is the simplest way to infuse a dose of sophistication into this ensemble.